MEXICO CITY, Distrito Federal. In what could have been discounted as a warm-up to Sunday’s game against the United States, Mexico defeated Honduras in style 3-0 at the Estadio Azteca to finish the first half of the final round of World Cup qualifying undefeated (4 wins, 1 draw). 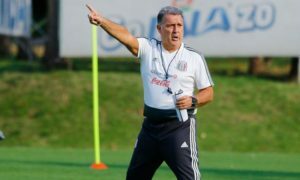 Oswaldo Alanis (34′), Hirving Lozano (63′), and Raul Jimenez (65′) all contributed to the blowout of a team that had arrived in Mexico City a week before to adapt to the altitude they would face at the Estadio Azteca. From the opening whistle, Honduras sat back on defense while Mexico looked to create chances on goal from possession. Tight marking from the Catrachos limited the chances for El Tri early, and frustrated the likes of Giovani Dos Santos and Luis Reyes among others. Early on, it was the visitors who created the better chances on goal, with Oliver Morazan getting a couple shots on target with space to shoot. Fortunately for Guillermo Ochoa, those shots by the Olimpia midfielder didn’t test his goal. 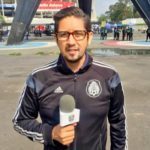 Two minutes after Morazan’s second open shot, Giovani Dos Santos tried to break the Catrachos defense by latching onto a change of pace diagonal ball delivered by Hector Herrera, but once again it was headed off the mark. And a few minutes later, Carlos Vela thought to move Honduras’ man-markers on a slaloming dribble, but he was left frustrated as the eventual shot also didn’t test Honduras keeper Donis Escobar. Eventually, Mexico found their breakthrough. In the 34th minute, a corner kick delivered by Jonathan Dos Santos found Oswaldo Alanis inside the six yard box, who headed it past Escobar to open the scoring. Five minutes from the second half, knowing his side needed a win to improve their slim hopes of a return trip to the World Cup, Jorge Luis Pinto took out midfield destroyer Mario Martinez and replaced him with the attack-minded Boniek Garcia. 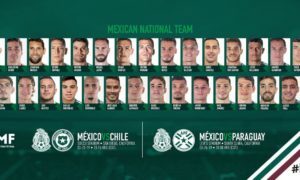 That substitution took away the defensive enforcement the Catrachos imposed on El Tri and helped to open up opportunities for the team to play more vertically to create chances on goal. And in the game’s sixty-third minute, Hector Herrera caught the Honduras back line to find Hirving Lozano alone on goal on a ball over the top to extend the Mexico lead to 2-0. Two minutes later, Raul Jimenez got in on the act to extend Mexico’s lead to 3-0, chipping the ball over Donis Escobar and into the goal in the process. El Tri had an opportunity late in the match to extend their lead to 4-0 late in the match. 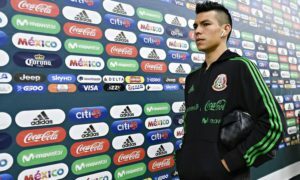 However, a chip attempt by Hirving Lozano in the eighty-first minute went over the cross bar. In the end, it was enough to extend the lead Mexico (4-1-0, 13 pts) had over the rest of the CONCACAF final round field to five points. El Tri could start to close in on a ticket to the 2018 FIFA World Cup on Sunday, June 11, when they face the third place United States (2-1-2, 7 pts).